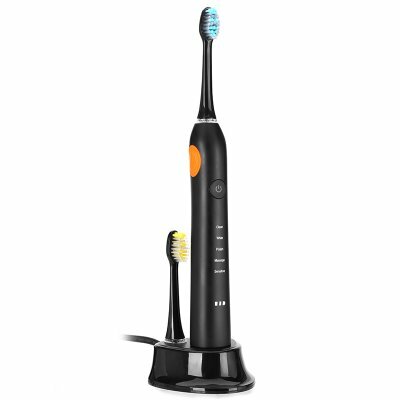 Successfully Added BLYL Electric Sonic Toothbrush - 31,000 to 48,000 Strokes Per Minute, Two-Minute Timer, DuPont Bristles, 5 Modes (Black) to your Shopping Cart. Brush your teeth the way dentists recommend and treat your mouth with a professional cleaning treatment with the BLYL Sonic toothbrush. This electric toothbrush has proven itself to thoroughly clean and aid your teeth – guaranteeing to reduce plaque build-up and furthermore supporting the whitening of your teeth. Coming with an abundance of features, stroke strengths, different brushing modes, and a powerful battery – this electronic toothbrush is guaranteed to work better than any other toothbrush or dental cleaning aid out there. Packing a 700mAh battery and energy efficient motor, this toothbrush allows you to brush your teeth for up to 6 weeks without it needing to be recharged. To ensure that you’ll always provide your teeth with the highest level of dental care out there, this electric toothbrush features an automatic brushing mode that has been recommended by dentists all over the world. Its automatic timer will brush your teeth for 2 minutes continuously with tiny breaks after every 30 seconds, indicating that it’s time for you to change the brushing area in your mouth. With the BLYL Sonic toothbrush, you will be able to treat your teeth twice or three times per day with professional-grade dental care – ensuring that you’ll end up with those healthy and pearly white teeth that you’ve always dreamt off. Featuring three different stroke speeds, this electronic toothbrush is capable of reaching 31000 to 48000 strokes per minute – allowing you to thoroughly clean your mouth whilst barely moving your hands. Additionally, it comes with 5 different dental care modes that include cleaning, whiten, polish, massage, and gentle brushing modes. Having these 5 different brush modes at your disposal, you can be assured that this electric toothbrush provides you with the top-end dental care your teeth deserve. Perfect for those that suffer from arthritis or have limited mobility – this power toothbrush allows you to fully clean, white, and polish your teeth without you needing to put in any effort or strength. The Sonic toothbrush features a soft brush head that packs plenty of high precision bristles crafted by the leading pioneers of synthetic filament, DuPont. With this high-end brush at your disposal, you can be assured that this toothbrush brings along a long life. Its brush head additionally lets you brush your teeth without you ever needing to worry about damaging your polish or gums again – making this the perfect dental aid for anybody out there that has the tendency to over brush their teeth with a hard manual brush or for those that have sensitive gums and teeth. The BLYL Sonic toothbrush comes with a 12 months warranty, brought to you by the leader in electronic devices as well as wholesale electronic gadgets..
Arabic: - فرشاة الأسنان الكهربائية - Chinese Simplified: - 电动牙刷 - Czech: - Elektrický zubní kartáček - Danish: - El-tandbørste - Dutch: - Elektrische tandenborstel - French: - Brosse à dents électrique - German: - Elektrische Zahnbürste - Hebrew: - מברשת שיניים חשמלית - Hindi: - इलेक्ट्रिक टूथब्रश - Italian: - Spazzolino da denti elettrico - Japanese: - 電動歯ブラシ - Korean: - 전동 칫 솔 - Malay: - Berus gigi elektrik - Norwegian Bokmål: - Elektrisk tannbørste - Romanian: - Periuta de dinti electrica - Russian: - Электрическая зубная щетка - Spanish: - Cepillo de dientes eléctrico - Thai: - แปรงสีฟันไฟฟ้า - Turkish: - Elektrikli diş fırçası - Vietnamese: - Bàn chải đánh răng điện. This is a genuine sonic toothbrush, its very powerful!! I would definitely recommend this product! The modes also work well. No bad points yet, very happy with the product, bought extra 3pcs!